Incendiary radio host Paul Finebaum created a niche for himself by dwelling in controversy. On Wednesday, Finebaum found himself on unfamilar ground, crawfishing and backtracking, trying to explain away a 40 minute-long commentary during which he painted Auburn in an incredibly unflattering light while heaping effusive praise on the University of Alabama. Over the years he built his reputation with skewering commentary and by fanning the flames of rivalry. But Finebaum is savvy. He lets his callers do the heavy lifting. The overwhelming consensus is that many of these callers are plants coached to promote specific topics or agendas and their calls open the door for Finebaum to carefully skirt the issues himself while still raising them for the masses. There was a time Finebaum was a talented and effective journalist. That time passed long ago. With the advent of his radio show he has slowly and steadily left that credibility behind to reign as ringmaster of a jackass circus. The recording currently available online of his lecture to a business class at Birmingham Southern College puts a different spin on the Finebaum pattern. Without callers to drive his discussion and provide him plausible deniability, Finebaum veered off the carefully scripted direction of his show and exposed what some now say are his true core values and opinions. For Auburn fans, they are hardly flattering. Finebaum essentially rehashed all the absurd message board rumors that have floated around for the last half dozen years or more. He propped up the predictable Bobby Lowder scarecrow as a punching bag, ridiculed Auburn recruiting efforts and plainly insinuated that the only way Auburn could compete with rival Alabama and Nick Saban is to cut corners or break the rules. He made insidious inferences about the recruitment of Michael Dyer saying “you live in Arkansas, is it really your dream to play running back at Auburn? No.” Of course Auburn’s long, successful history of great running backs — from Bo Jackson to Carnell Williams — couldn’t have played a role. Nor could the presence of Gus Malzahn, an Arkansas native and easily one of the top five offensive coordinators in the country, have played any part. He questioned Auburn’s ability to win a national championship two years after struggling through a losing season, yet heaps praise on Alabama for performing a very similar turnaround. 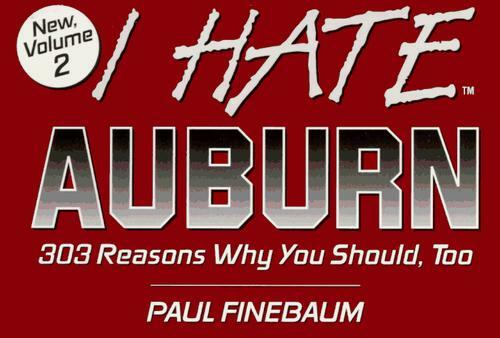 Apparently Finebaum slept through the last 30 years while Auburn was the superior program on and off the field. He snickered about Auburn’s recruiting efforts and ridiculed specific examples such as Tiger Prowl and Big Cat Weekend, both of which were successes and helped boost Auburn’s profile among major recruits. Conversely he praised Alabama’s recruiting efforts as being outstanding without offering any substantive rationale. Alabama is awesome just because they are was his basic platform. Auburn recruits well so they must be doing something wrong. Alabama recruits well so they must be doing something right. In his condescending patter, Finebaum turns a blind eye to the fact that Auburn has recruited as well or better than Alabama for most of the past three decades. He channeled the absolute worst of the moronic callers to his show, essentially parroting the “Aubren won, so they musta cheated Pawwwwl” mantra that’s been the persistent backbeat to his program for almost a year now. His comments were incredibly insulting and if you’ve visited the most rabid, tinfoil hat-wearing Bama-backed fan-based websites on the Internet, you’ve probably already heard the majority of them. They are, frankly, not worth repeating. A caller to his radio show on Wednesday weakly attempted to pin Finebaum down about the controversial statements. Finebaum crawfished an answer that was completely unsatisfying. He claimed he was merely trying to stoke debate and that his comments were taken out of context. He suggested he was simply asking questions and trying to get the class to react. He said he might have phrased things poorly and in retrospect might have used some unfortunate wording. Please. You used to be better than that, Finebaum. If you listen to the audio of his comments to the students at Birmingham Southern, his justifications simply don’t bear up. He was not asking probing questions. He was not making an effort to engage debate. His case was that “Auburn did it wrong, Auburn cheated, Auburn circumvented the system.” He mockingly challenged the students to show him how he was wrong. That’s not engaging in debate. That’s a typical tactic used by pious judges during a witch trial. “You are a witch because your hair is red. Prove that you are not.” It’s an impossible proposition and clearly illustrates a personal bias that goes far beyond any fan-fueled bantering. If you are an Auburn fan, you have every right to be outraged. You have every right to express that outrage to the appropriate parties. Just don’t expect instant miracles. Paul Finebaum isn’t going anywhere any time soon. He’s been a part of the sports media scene in Alabama for far too long for any effort to oust him or radically change his tactics to be successful. Yes, you can turn him off as many, many Auburn (and Alabama) fans have over the years. Yes, you can attempt to flood his show with callers to question his stance, but the Finebaum Network has many “regulars” with their own private call-in numbers and the call screeners are extremely efficient at driving the direction. The chances of making any significant short-term impact are nil. If you choose to listen to Finebaum’s show, understand it for what it is — entertainment only. The Finebaum Show is to legitimate discussion as the WWE is to legitimate sports. His agenda is first and foremost self-promotion. His goal is to generate calls and in the grand scheme of things it really doesn’t matter to Paul Finebaum who he drags through the mud to do so. Those tactics have made him a rich man and a self-proclaimed powerful voice in sports media. That doesn’t mean that Finebaum, or any member of the media, should be allowed to rant unchecked. He should not be allowed to degrade and defame Auburn (or any other institution) without recourse. By all means let WJOX know you’re insulted by his comments to students at Birmingham Southern. Contact the parent company, Citadel Broadcasting, and express your opinion. Contact Birmingham Southern College and let the administration know you don’t appreciate how Finebaum approached the forum he was offered. Turn the radio dial to something more intelligent (does Larry the Cable Guy have a show?) or turn it off. Unfortunately don’t expect much immediate change. Finebaum has been too successful for too long to alter the methodology now. He will continue to excite and inflame, he’ll continue to embrace controversial positions and he’ll continue to ride both sides of the fence in a politically expedient manner. When it behooves him to defend Auburn as he did late last year in regard to the Cam Newton situation, he will do so. When he can get more mileage out of bashing the Tigers, the switch will be effortlessly flipped. He and his show thrive on anger and invective. Without it, he has nothing to offer. Finebaum built his empire by catering to the most crass and vulgar components of the sports fanbase. His show kowtows to the uneducated, the uninformed and the lowest common denominator. His regular callers are hardly representative of the respective fanbases, but because of the pervasiveness of his show, it’s how we all are perceived. That the unadulterated classlessness displayed by the callers to his show reflects horribly on the state as a whole is of no consequence to Finebaum. Although he vehemently and defiantly denied any role his show might have played in emboldening Harvey Updyke, the alleged poisoner of the oaks at Toomer’s Corner, there is no question that his show provides a major platform to stoke the fires of fury and frustration that could lead someone like Updyke to consider that his actions might not only be tolerated, but celebrated as a victory. One can always hope Finebaum will have the fortitude to address his fairly obvious bias and explain the context behind his lecture at Birmingham Southern. We challenge him to do so. If there are truths out there that need to be exposed, by all means bring them forth and stop hiding behind veiled comments, snickering innuendo and thrice-recycled message board rumor. One can expect that Birmingham Southern and professor Byron Chew (1971 doctoral graduate of the University of Alabama), who invited Finebaum to address his business class, will think twice before extending the same offer again. One can always hope that Finebaum might offer a sincere apology for the tone of his lecture or that he might realize that his show adds kerosene to an already roaring blaze and rein in some of the hate that permeates every afternoon. One can hope that he may realize that at the very least he holds some responsibility for the rising tensions and that he might step back and remind his rabid callers that it’s just a game, not life and death. Based on Finebaum’s history, don’t hold your breath. It’s been a many, many years since he drove a tractor to Auburn after promising to do so if Pat Dye’s Tigers beat Alabama. Finebaum has long since stopped holding himself accountable. 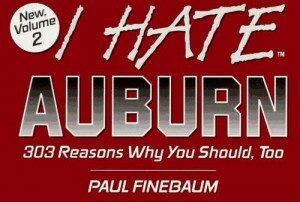 No true Auburn person should listen to finescum! He is an updyke and proud of it. I can not comprehend his claim of being “objective” when it comes to Auburn. Each year, he serves as a celebrity coach at the UAT A Day game (photos all over the net confirm this), as well as the annual “Breakfast with the Saban’s” segment he does with Rick Karle from Fox 6 WBRC in Birmingham. What was this professor thinking, inviting Finebaum to lecture his class? Unless his proposed topic was “The Business of College Football”, what on earth would Finebaum talk about that dealt with Business? Fbomb is no friend of Auburn. you are correct he has plants to call his show and throw out lies and half truths. And fbomb takes those lies and run with them, as being factual. Fbomb is in the pocket of the REC and has been since his move to WJOX. His whole demeanor changed when he switched stations and became part of the Alabama Network. Well written. It is time to begin the long process of taking this scumbag down. This foundation is the perfect vehicle to do it and we should begin. THis article is a good beginning.How can I help? His “wife” is Dr. Linda Hudson, a Vandy grad. Check out http://AuburnSmack.com! its a saweet Auburn sports blog. Also love the foundation. Keep it up. Great read! Can you please print names and contact info for FBomb’s sponsors? Let’s get on it! Money talks…we may not shut him down but we can scare him. How do we prove his callers are plants? If we could prove even one is a plant that is damaging enough. Let’s be David and bring down the evil giant. NTYF…where talk show hosts are…fired! Let’s do it! ALL IN! War Eagle! I quit listening to his show years a go because of his UAT bias and would love to see a list of his sponsers printed..
My question is this..why do our coaches, players, and Bunker mods go on his show to talk about Auburn…why in the world do they not tell him to kiss of…they’re shouldnt be any Auburn fans listening anyway..so what have we got to gain…and after reading this article…hat do we have to lose?? Have ya’ll seen this BS in response? @JR – Yes, I know it was for the college class. My comment was directed a the radio show itself.